All parties agree on the necessity of a political solution for Idlib, Presidential Spokesman Ibrahim Kalın said late Friday. 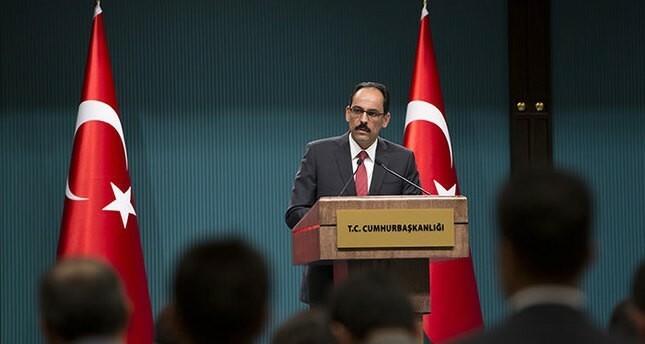 Speaking after the Quartet meeting, Kalın also said that airstrikes against the war-ravaged town are totally unacceptable. "President Erdoğan's Sochi visit is of crucial importance," he added. Representatives of Turkey, France, Germany and Russia held a preparatory meeting in Istanbul earlier on the same day for an upcoming quartet summit on Syria. The meeting took place at the Prime Ministerial Office in Istanbul. Kalın represented Turkey, while Chancellor Angela Merkel's national security consultant, Jan Hecker, represented Germany and French President Emmanuel Macron's chief diplomacy consultant, Philippe Etienne, represented France. Russia, on the other hand, was represented by the chief consultant for Russian President Vladimir Putin, Yuri Ushakov. During the meeting, the representatives of the countries were expected to determine the date of the upcoming quartet summit. President Recep Tayyip Erdoğan previously announced on Sept. 9 that the representatives would meet and that a leaders' summit might be held soon. The current situation in Idlib tops the summit's agenda. Erdoğan also previously reiterated Turkey's resolve to find a solution to Idlib crisis via diplomatic means. Saying that "Turkey will neither watch from the sidelines nor participate in such a game" to "further Regime's interests," the president added that "Astana spirit" should reign in ways to find a "sustainable political solution" for the Syrian city under threat of an imminent attack from the regime forces.